In 2004, 44 year old Harjit Singh (not his real name), a Pakistani national and a baptised Sikh man opened a Sikh faith school in a district of Peshawar in Pakistan for the children of his minority Sikh Community. Shortly after the school was opened, a member of the Taliban in the region contacted Harjit Singh and ordered him to close down the School with immediate effect, failing which, Harjit Singh said that he was threatened with death. Harjit Singh recognised the threat to be real and immediate. The representative of the Taliban making the threat is known to the communities in the region. Mr Harjit Singh refused to close the School. As a consequence, the Taliban issued a ‘fatwa’ against him with an order to kill him. The Taliban filed a formal complaint (‘First Investigation Report’ – ‘FIR’) against Harjit Singh with the local Police. The complaint was that Mr Singh had opened the Sikh School despite their objections . The Taliban have a powerful influence and presence in the region. The Taliban is above scrutiny in the region. 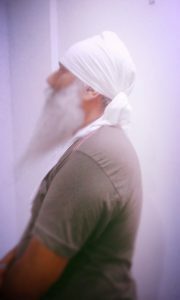 Harjit Singh sought help from the local Sikh leaders who were unable to assist. Harjit Singh said that they do not have any power – they too live in fear of the Taliban. The school was forced to close in 2004. Harjit Singh together with his wife aged 39, and three children (aged 15, 13 and 11) fled their home in fear that the Taliban will continue to pursue them. Mrs Singh and their children stayed with her family, whilst Harjit Singh moved from city to city to find a job to support himself and his family. Harjit Singh was unable to find a suitable job . Eventually, he did find casual employment, and on both occasions, his work colleagues found out that he was on the run from the Taliban. He had no choice but to leave his job. At one point, he was identified by a man from from his village who happened to be in the area where Mr Harjit Singh was staying at the time. Mr Harjit Singh maintains that this man proceeded to disclose his whereabouts to the Taliban. In April, 2017 Harjit Singh had no alternative but to flee Pakistan taking his wife and young children with him to a safe country where he has sought asylum. Mr Singh’s and his family’s application for asylum is waiting to be progressed. The family are extremely anxious about their future and concerned for the safety of their friends and family in Pakistan. Mr Harjit Singh said ‘The threat from the Taliban is real, I had no alternative but to ensure the safety and future of my children and my wife. Sikhs are a minority in Pakistan. We are forced to pay ‘jizya’ [historically a form of tax charged to non- Muslims living in an Islamic country]. Mr Harjit Singh said he ‘….Pakistan is his ancestral home however, he denied the right to practice his faith freely. Sikhs in Pakistan are forced to pay the jizya tax to practice their faith, even to access roads (they are required to pay arbitrary amounts of toll) We are oppressed in our own country’. Jas Uppal from ‘Justice Upheld’, a British Human Rights charity based in the U.K. who has been instructed by Mr Singh, said that ‘We view the treatment of Mr Harjit Singh and his family in Pakistan as being nothing short of oppression, discrimination and persecution of a minority. We understand that the Sikh population in Pakistan is currently less than 20,000. Prior to the Partition in 1947, the Sikh population combined with the minorities in Pakistan was 20% in the region. This has now been reduced to less than 1%. The Sikh population was not even recorded in the 2017 consensus in Pakistan’. The world is ignoring the suffering of Sikhs and other minorities in Pakistan at their peril which has emboldened the persecutors to continue with impunity’.